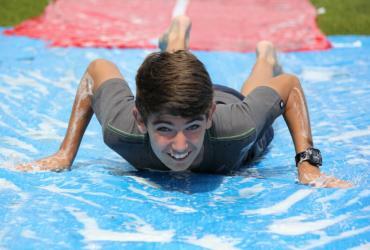 At our camps we promote healthy and diverse living through a timetable of high energy and interactive activities including sports, drama and climbing, among many others. All activities require a certain amount of physical and mental vitality, so it is important that our healthy lifestyle approach extends across camp with a focus on the food that we offer. As well as nutrition and sustenance, meal times are a way of socialising and recuperate after a busy session. Our BBQ’s have also become a firm favourite with our campers and staff which, weather permitting, allow for some alfresco dining. Catering to individual needs is important to us, and so we will work to ensure children with food allergies and other dietary needs get the same quality food as everyone else. If you just mention any special dietary requirements when booking we can accommodate these throughout the summer. All of the above have accompaniments. Plus a selection of cereals, white & wholemeal toast with a selection of spreads (butter, jam, marmite and honey) as well as fruit. Drinks: Water, hot chocolate, milk, orange juice and apple juice. 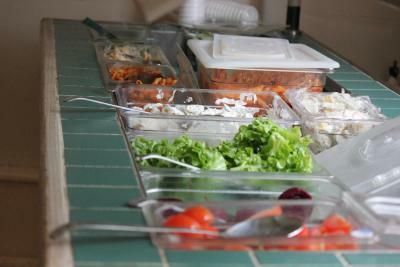 Each day there are additional options inc: bread & butter, soup, pasta salad, salad, fruit and yogurts. Each day there will be wholemeal bread and butter, soup and a selection of salads. Drinks: Water and fruit squash.